British royals joined Hollywood movie stars for the British Academy of Film and Television Arts (BAFTA) Awards at the Royal Albert Hall in London on Sunday night. Prince William, who is president of BAFTA, and his wife, Kate Middleton, graced the red carpet with regal elegance, while Hollywood shone in a variety of styles. More than a night to celebrate the British film industry, it also shone a light on the talent of designers Stella McCartney, Erdem and Christopher Kane. 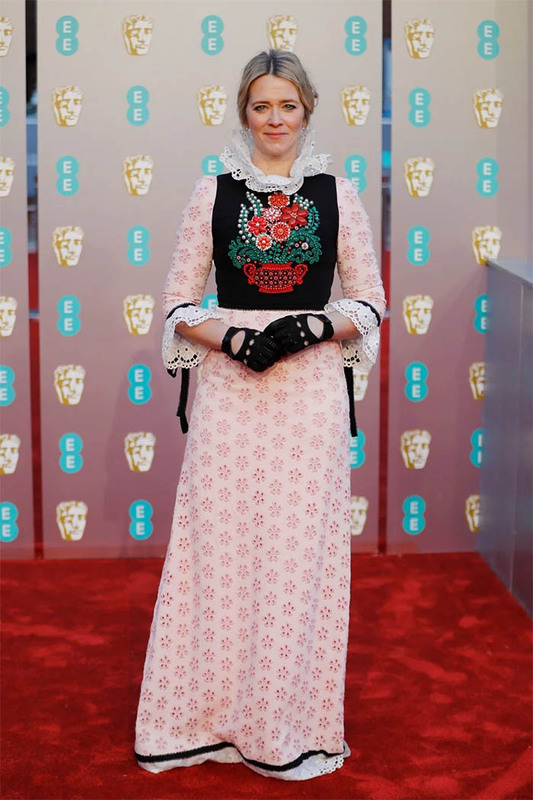 Red carpet host Edith Bowman might be paying tribute to English country style, but this was not the right occasion. Zawe Ashton dons a Roksanda pink gown with black flats, which looks shapeless and short. Maya Jama might have looked elegant if she had a tidy hairstyle to go with her sheer black gown. Salma Hayek’s simple black Gucci gown is gorgeous, excellently tailored and perfectly adorned, which makes the headpiece unnecessary. Kate Middleton wears a cream white one-shoulder gown and shiny Jimmy Choo pumps. Her pearl earrings are the same pair that Princess Diana wore when accepting the United Cerebral Palsy Foundation’s Humanitarian of the Year Award in 1995. Cate Blanchett in a bespoke Christopher Kane dress, Sergio Rossi shoes and Pomellato jewellery. 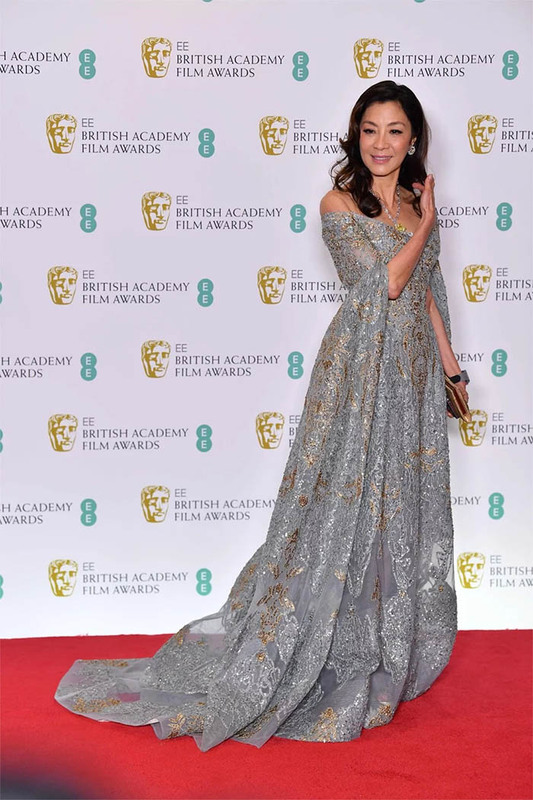 Michelle Yeoh in Elie Saab haute couture. 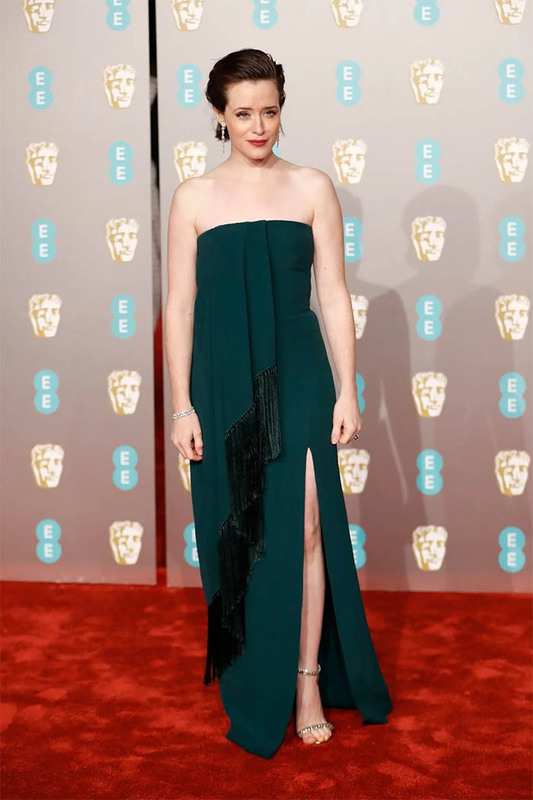 Claire Foy in an Oscar de la Renta dress and Jimmy Choo shoes. Lucy Boynton in Dior and Swarovski jewellery. 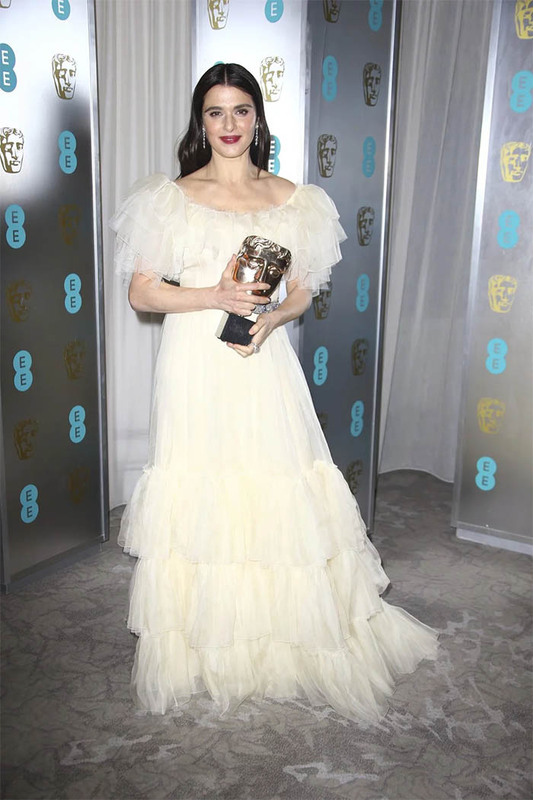 The Favourite star Rachel Weisz dons an off-white Gucci frock.